There are many drivers for planning permissions applications in Ireland, including traditional ones (economic fundamentals, demand, credit supply availability etc) and idiosyncratic (changes in planning regime etc). Not to comment on either of these, here are the latest stats (through Q1 2014) on the subject. Q1 2014 registered an uplift in total number of planning permissions granted, which rose y/y by 17.0%. This sounds like a large number, except the problem is - it comes off such a low base that Q1 2013 actually was an absolute historical low for planning permissions for any quarter since Q1 1975. 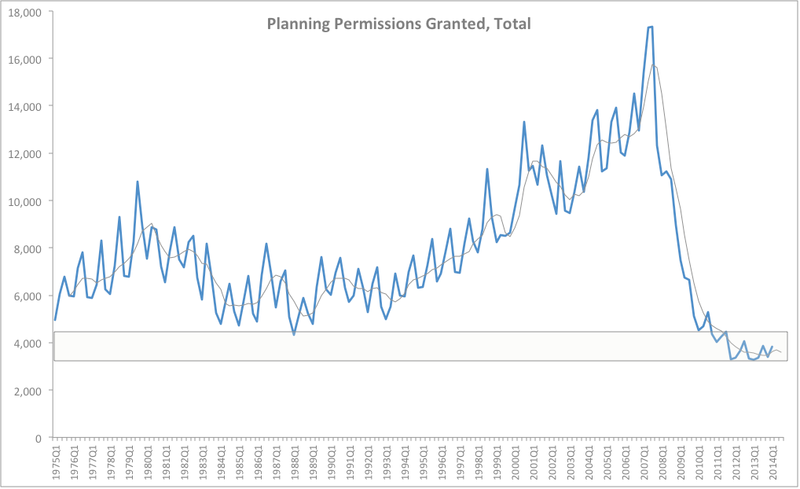 In real terms, as the chart below clearly shows, since Q1 2011 through Q1 2014, maximum number of planning permissions granted barely reaches previous historical low in Q1 1988. That's right: the worst of the 1970s-1980s is the best of 2011-present range. In fact, Q1 2014 'improved' activity in terms of planning permissions is 11.7% lower (that's right - lower) than 1975-1999 lowest point. 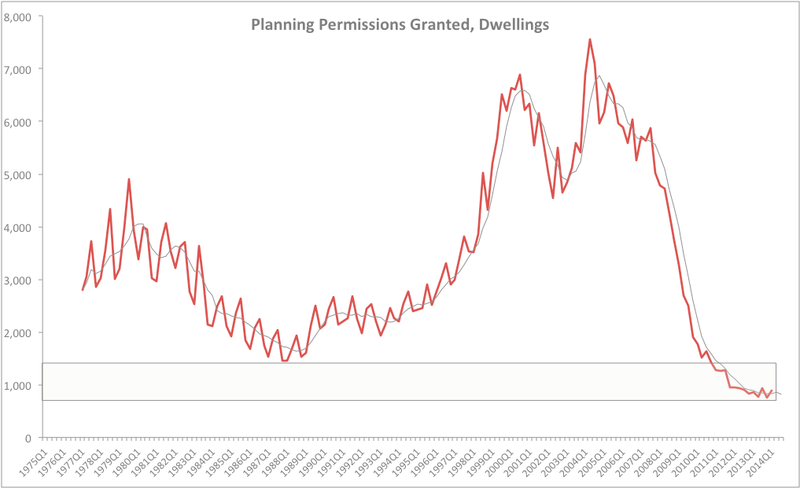 Dwellings permissions are currently sitting 38.9% below their absolute low of 1975-1999 period, although these did rise 3.36% year on year. In terms of total square meters relating to permissions granted, things are no better. Year-on-year volume of permission granted by square meters is down 20% for all applications. 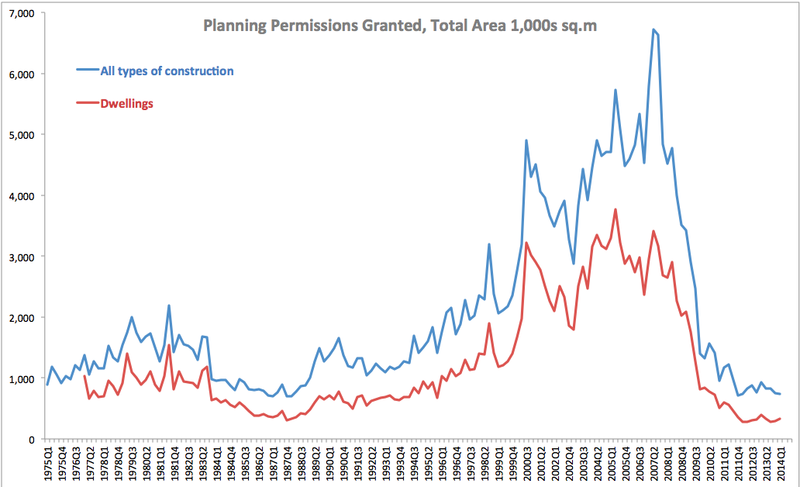 From Q1 2011 through Q1 2014, total square meters of permissions granted have been trending basically in line with the lowest levels reached in the 1980s. I am not sure if anyone can tell with any degree of confidence as to what the effect of new regulatory regimes is on these numbers, but one thing is very clear - the recovery is not to be seen anywhere in the above numbers, yet. Despite some reports in the media and from the industry suggesting that things are getting better and better. I trade in data, not feelings or sensations. The latter, not to discount them or question their validity, is not what is covered in this post. What is, however, covered is in plain view and evidence based. Did you consider the cost of airfares (pre-Ryanair), telecommunications (pre-internet), interest rates which were historically 4-5x higher in your analysis? Specific example Aer Lingus only had a direct flight from Dublin to Munich for 6 months of the year (in winter I had to travel via Frankfurt) all for the princely sum of £300 (not adjusted for inflation). I posit that viewed through this prism the misery of the 1980s compared to the narrow analysis you performed, will be obvious! Pardon me, but what on Earth do these have to do with Planning Permissions Granted being worse than in the 1980s?! And global temperatures were cooler and beer was cheaper and household debts were lower and companies debts were lower too and... so what has any of this to do with a simple observation that PP granted are lower today than at the worst case in the 1980s? Do you always look for a comprehensive description of Life, Universe and Everything in anything you read? In which case the answer, of course is '42'. Correct me if I'm wrong but the title to your piece does begin with the statement "The 'Recovery' is Still Worse than the 1980s Crisis" does it not? If so how exactly do you arrive at that statement based on PP applications alone? In my opinion the facts do not support the title of your piece and considering the broader picture now versus then would lead any reasonable person to the conclusion that your assertion is not grounded in reality. This is getting outright bizarre. Last I checked, the title is: "Planning Permissions in Ireland: the 'Recovery' is Still Worse than the 1980s Crisis". It appears some people are commenting without bothering to read the article. Tut-tut M&D.